The Copy Chart Properties function is a very powerful feature that you can use to copy a number of properties of the selected chart to any other charts in your workbook. In addition to copying the chart format, you can have your chart’s title fully or partially copied to other charts. Use this feature to copy chart sizes, axes, titles, and more. 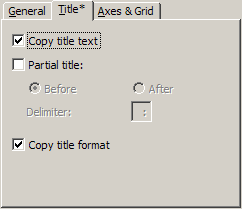 As you can see in the screenshot to the right, the Copy Chart Properties dialog has three panels. In the top panel, you see an image of the currently selected chart whose format will be copied to other charts. On the left you can select which properties to copy; see below for a complete description of the tabs General, Title , and Axes & Grid. In the bottom left panel, you see a list of charts in your current workbook. 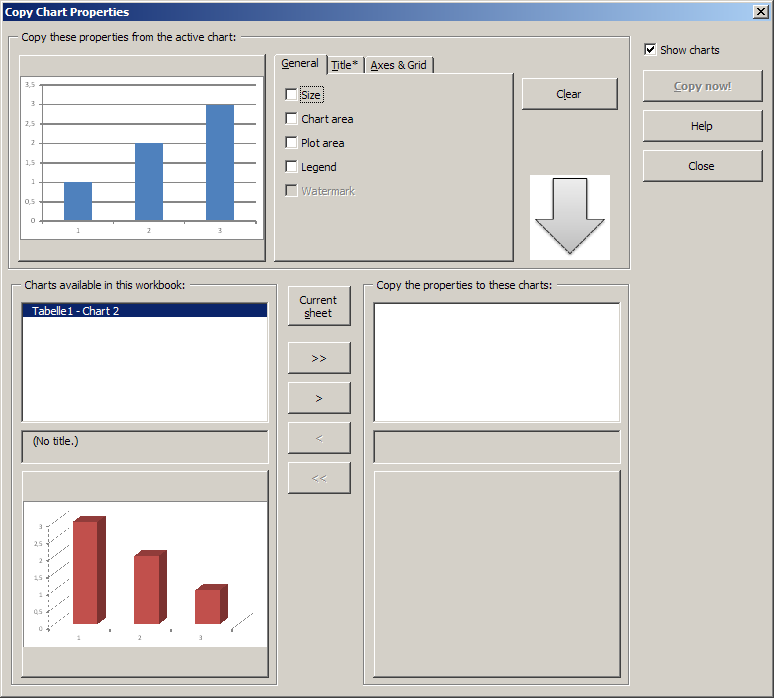 In the bottom right panel, you see your selection of charts that the current chart’s properties will be applied to. Use the buttons between the bottom panels to select the charts that the properties will be copied to: The double arrows select (“>>”) or deselect (“<<”) all charts, and the single arrows select of deselect the currently highlighted chart. Click on “Current sheet” to add all charts of the active worksheet to the list of selected charts. Click on Copy now! to start copying the chart properties to the selected charts. Use the Show Charts option to toggle the chart thumbnail display. If you enable Irfan View in the Preferences, you will get better quality thumbnails. When any of the options are selected, you will see an asterisk (“*”) next to the caption of the tabs General, Title, or Axes and Grid. To clear all options at once, click on the “Clear” button to the right. 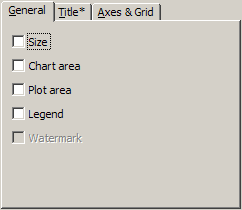 On the “General” tab, you can choose to copy the chart size, the chart and plot areas (colors and borders), the legend and the watermark (if one is present). Note that you cannot copy the size of a chart sheet (i.e., a chart that is insert as a separate worksheet in the workbook, rather than being embedded in a spreadsheet). On the “Title” tab, you can choose to have part or all of your chart’s title copied to the other charts. If you want to copy only a part of your title, you can indicate whether to copy the portion before or after a ‘delimiter’. Example: Say you have several charts that are all titled “1st Experiment: Raw data”, “1st Experiment: Normalized data”, and so on. To change the “1st Experiment” part to “2nd Experiment” for all charts, edit the title of one chart first. Then, use the Copy Chart Properties function and select “Copy title”, “Partial title”, and “Before”, and enter “:” as the delimiter. Now the text that occurs in front of the colon will be exchanged for the corresponding text of the active chart. On the “Axes and Grid” tab, you can choose to copy the X and Y axis titles, the axis line format, the axis scale, and the gridlines (if present). If a chart sheet is the active chart, you cannot copy its size to other charts. If an embedded chart is the active chart, its size will not be copied to chart sheets. “Chart sheets” are sheets that appear as a whole sheet in your file, as opposed to charts that are embedded in a spreadsheet, on top of the grid of cells (these are chart objects). Be aware that any changes that the Copy Chart Properties function makes to Chart Sheets cannot be undone! If you have a .XLS file (Excel 97-2003 file format) that was saved by Excel 2007, some chart features are not accessible by Excel’s programming language. Thus, certain chart properties of “downgraded” charts may not be copied. ‘General’ tab of the options dialog. ‘Title’ tab of the options dialog. 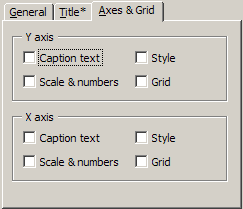 ‘Axes’ tab of the options dialog.